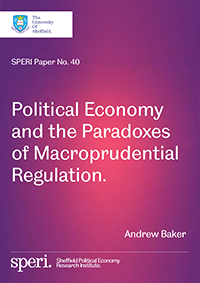 We are pleased to publish a new SPERI Paper by Andrew Baker which takes a close look at macroprudential regulation by engaging with its constituent concepts and how they interrelate to one another. Andrew Baker argues that the emerging political economy of macroprudential regulation revolves around five paradoxes. The first three of these are paradoxes that characterise the financial system and are identified by the macroprudential perspective. In seeking to respond to these paradoxes, macroprudential policy generates a further two distinctly institutional and political paradoxes. The last of these is a central bankers’ paradox which relates to the source of independent central bank authority and the difficulty of building legitimacy and public support for macroprudential regulation. Functioning macroprudential regulation is about executing a technocratic control project that rests on a depoliticisation strategy, that in turn risks politicising central banks, exposing their claims to technical authority to critical scrutiny and potential political backlash. This is the ultimate central bankers’ paradox in the era of post-crash political economy. Central banks conducting macroprudential regulation need to be aware of this paradox and handle it with great care. Download SPERI Paper No. 40: Political Economy and the Paradoxes of Macroprudential Regulation.